PAVI, a major supplier of auto spare parts from France, hired Mecalux to install the necessary equipment in its warehouse in Saint-Priest, a town near the city of Lyon. The supply included two levels of mezzanines, racking, conveyor belts and automatic sorters, as well as the Mecalux Easy WMS warehouse management system. The needs of PAVI required the construction of a warehouse capable of storing a large number of SKUs of varying dimensions and characteristics, as well as being low consumption. To do this, a storage system was needed that offered optimal use of the surface area, as well as being highly flexible and allowing direct access to any product. The main objective of the company was thus met: rapid service for its customers. Construction of a structure capable of integrating two raised floors on a 2,000 m2 area, which would allow the floor space to be tripled. Installation, on each of the floors, of racking with different sizes and types of distribution in order to suit the different products. Implementation of a continuous and automatic transport system connecting all the floors. This means operators can prepare orders by area and transport them to the specific sorting and consolidation area after completion. The circuit is also used to send empty boxes from the lower level to the order preparation stations. Replenishment of the goods directly from the receiving container to their locations. On each floor, pallet unloading docks have been installed on the other side of safety swing doors. Swivel modules have also been located at strategic points along the transport circuit for the passage of operators. Installation of access stairs between floors, enabling access and rapid evacuation during possible emergencies. All of this is controlled using the Mecalux Easy WMS warehouse management system. The ground floor is dedicated to bulkier products with direct picking and does not require the use of conveyors. Also, the high consumption products are stored here, for which picking stations have been prepared adjacent to the conveyor belts. The second and third floors of the PAVI warehouse have a very similar distribution and products of identical size are stored on both of them. In addition, the conveyor circuit on these two floors runs along the main aisle, with the order picking finishing on the top floor. Roller tables have been set up and attached to both sides of the conveyors on different parts of each floor in order to collect the boxes containing unfinished orders and serving at the same time as picking stations. Through the three floors, ten picking stations have been set up, each one corresponding to a different area or sector in the warehouse. The boxes, once the part of the order assigned to a zone has been put together or completed, are placed on the main conveyor circuit to be transferred to the stations in other areas or to the sorting area. The circuit descends along conveyor belts from the third floor to the bottom floor, where the classification and consolidation of orders is performed. In this area, the operators check, pack and draw up the packing list and the shipping labels of the orders.To complete the operation, there are packing boxes of different sizes, prep tables, computers and printers. The Mecalux Easy WMS (Warehouse Management System) is responsible, among other things, for managing all the incoming processes, choosing the location where the goods are received, controlling the stock, designating the picking functions to be performed by each operator, executing the movement of the boxes and sending the orders via computer terminals. 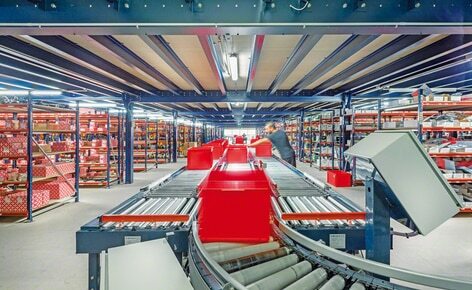 The program for controlling the conveyors is connected to the WMS itself in order to ensure the efficient transport and allocation of boxes, eliminating human error and reducing PAVI’s personnel costs. Excellent use of space: it was possible to increase storage capacity and triple the floor space through the construction of two raised floors. Integrated warehouse: each of the parts that make up the warehouse are integrated with each other. Adjustable storage needs: the distribution of the racking can be changed if the turnover rate of a product varies or if the future needs of PAVI so require. Elimination of internal movement: as a result of the installed conveyor circuit and the optimal placement of the racking, it has been possible to eliminate part of the internal movement made by the operators. In this way, productivity is increased and human errors are minimised. Fast order picking: the storage system installed is highly flexible and allows the operator to have direct access to any product. Efficient picking: operators can prepare orders by area using the continuous and automatic conveyor belt circuit that connects all the floors. Perfect control of the stock: using the Mecalux Easy WMS warehouse management system, PAVI can manage all the flows, processes and operations that take place within its warehouse.